Toyota wanted its Prius Prime plug-in hybrid to stand out, so designed the car with a different front fascia and rear end. The Prius Prime also has a slightly different interior with an 11.6-inch touchscreen infotainment system. While the 1.8-liter four-cylinder and pair of electric motors don't combine for any more power than a standard Prius (121 horsepower), the Prime is able to cover 25-miles on electric range alone. The Prius Prime starts at $27,300 for the well-equipped Plus trim, $29,000 for the mid-level Premium trim, and $33,300 for the top Advanced trim. After spending a week with the 2018 Toyota Prius Prime, I am reminded of the story of 'The Emperor's New Clothes.' The story tells of a vain emperor who cares only about the prestige of the clothes he wears. He commissions two weavers to craft him the most magnificent clothes imaginable, yet the two men actually con the emperor by telling him the clothes will be invisible to anyone who is unfit for their position. He falsely claims to love the clothes, as do his subjects. The charade continues until a naive child (having no understanding of social pretenses) finally points out how, alas, the Emperor isn't wearing any clothes. In this case, Toyota represents the emperor, the Prius Prime represents the clothes, and I, sadly, represent the child, forced to tell my emperor that he has been conned and is in fact, completely naked. The Prius name has almost become an eponym in the automotive industry - a ubiquitous brand name like Kleenex, Velcro, or Band-Aid. Toyota introduced the Prius back in 1997, and it really caught fire in 2003 when the second generation was released. In fact, Toyota was among the first companies to truly embrace hybrid vehicles and managed to take an enormous lead on the competition by building and capitalizing on the strong brand cachet. We'd struggle to call the Prius attractive, yet Toyota has managed to sell at least 100,000 units of the Prius family every year since 2004. Clearly, buyers are perfectly willing to trade a bit of style for nearly unparalleled fuel economy. The thing is though, the Prius has enjoyed over a decade with very few strong competitors. Now, other automakers want what Toyota has - namely lots of buyers - and it looks like they may have the tools to take them. Is The Engine Any Different? The Toyota Prius family currently includes the standard Prius, the compact Prius C, and the plug-in Prius Prime. Even though Toyota was quick to jump on the hybrid bandwagon, the . The Prius Prime is a hybrid of the plug-in variety, meaning it can be plugged in and charged to drive on electric power alone as well as driven around like a normal hybrid car. Like a standard Prius, the Prime is powered by a 1.8-liter four-cylinder producing an underwhelming 95 horsepower and 105 lb-ft of torque going out through a CVT. The engine is aided by an electric motor, bringing total output up to 121 hp. Though the larger battery in the Prime doesn't do much to add to the performance, it does enable a 25-mile electric driving range and a nearly 600-mile total driving range. 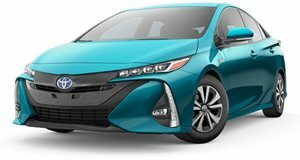 A standard Prius can achieve excellent fuel economy - 58 mpg in the city and 53 mpg on the highway - while comparatively, Toyota rates the Prius Prime at 54 mpg combined or 133 MPGe with the electric motor running. Without the battery charged, the Prime feels very much like a normal Prius. When relying on the electric motor, the car is able to run in near silence with a friendly shove of electric torque. It certainly isn't rapid at 10.2 seconds to 60 mph, but the electric torque does feel more stimulating than the sluggish gas engine and CVT combination. One of the biggest benefits of stepping up to the Prius Prime is the 25-mile electric driving range. If for example, your commute to work was only 12 miles, you could do the entire trip without having to engage the gas engine. In a normal hybrid, the batteries only work to aid the gas engine - in a plug-in, they are able to drive the car at normal speeds over longer distances. Aside from the drivetrain changes, there are some obvious differences in the exterior design. The Prime is 2.4 inches longer, 0.6 inches wider, and about an inch lower than the standard Prius. 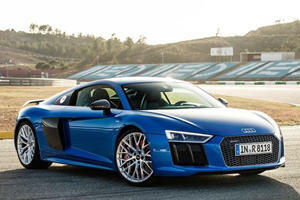 It also includes more stylish LED headlights and taillights, which are both brighter and more aesthetically pleasing. On the interior, Toyota has clearly tried to copy Tesla with a massive 11.6-inch touchscreen display. While the visual changes are welcomed on the Prius Prime, not all of the changes are positive. The touchscreen, while larger than normal, it a bit distracting to use due to a lack of physical buttons and knobs. And although it looks like a Tesla display, it is nowhere near as useful. In fact, the Prime's screen barely functions any differently than a standard Toyota unit, meaning it lacks Apple CarPlay or Android Auto. In the back, the Prime also loses its middle seat and the trunk is severely limited due to the larger battery. 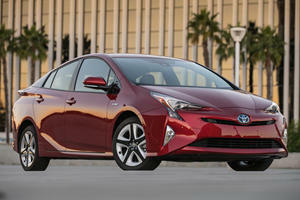 The standard Prius offer 24.6 cubic feet of storage but this number shrinks to just 19.8 in the Prime. During the week, I was sent a but due to a lack of height in the Prime's trunk, it barely fit and still impeded the view out of the lower glass in the hatch. One area where Toyota succeeds is the interior. My passengers were very impressed with the interior design and Toyota has found clever ways to make plastics seem upscale. Most of the cabin is filled with a white plastic trim, which looks a bit like the material you'd find on a boat. It has a premium feel and gives the interior a futuristic look. My passengers were also quite impressed by the large touchscreen until I asked them to perform a simple task like change the radio. After deeming the task to be difficult, I then reminded them how tough the screen would be to use while driving. The issue lies with the lack of dedicated controls surrounding the screen. All of the climate and radio controls (except for temperature, volume, and defrosters) are controlled on the screen and require several clicks to find. Luckily, most of the functions can also be controlled on the wheel, so you don't have to take your eyes off the road to dig into menus. Toyota continues to place all of the important readouts in the middle of the cabin, which is a bit strange when you first hop in and don't see any gauges in front of you. You do get used to it pretty quickly and my Advanced trim tester was fitted with a helpful head-up display to ease the transition. As you may expect, the Prius Prime does cost a bit more than a normal Prius. The base Plus trim starts at $27,300 and comes very well-equipped with adaptive cruise control, lane departure warnings, smart key, and remote A/C control. Stepping up to the Premium trim for $29,000 adds heated leather seats, the larger touchscreen, navigation, and a wireless charger. My tester was the top Advanced trim for $33,300, which adds a HUD, 10-speaker JBL audio, blind spot monitoring, parking assist with self-parking capability, rear cross traffic alert, and LED fog lights. All of these prices also include a $4,500 tax credit from the government, so be sure to factor that in your buying decision. $4,500 is a nice rebate, but the similarly priced Honda Clarity receives the full $7,500 tax credit. This year, I've had the and the . I've also briefly experienced two of the Prime's other rivals, the Chevy Volt and Hyundai Ioniq Plug-In. After driving all of these other plug-in models, I could not ignore the Prime's flaws. For starters, the Prime's 25-mile electric range trails behind the Clarity's 48-mile range and the Volt's class-leading 52-mile range. The Ioniq and Niro also beat the Prime with 29-mile and 26-mile ranges. Not only are these other plug-ins able to travel further on electricity, making them more useful on a commute, but most of them also look like "normal" cars (with the Ioniq being the lone exception). Toyota has locked itself into the thinking hybrid cars need to look strange. As we have seen with handsome plug-ins like the Niro and Volt, hybrid cars can look normal and still achieve excellent fuel economy. The Niro and Clarity also trump the Prime on practicality, with far more room in the interior and five usable seats instead of four. Although I doubt anyone will ever buy a Prius because of how "fun" it is to drive, it doesn't mean Toyota can afford to keep letting the car feel sloppy. Compared to the Clarity and Niro the Prime's steering feels completely vague and lackadaisical. Kia and Honda have found clever ways to inject an ounce of fun into their plug-ins - for Honda, it is tight steering and a whopping 212 hp and for Kia, it is a sporty dual-clutch transmission and peppy sport mode. The Prius Prime does have a power mode but it only makes the acceleration feel tolerable rather than inspiring. Compared to a standard Prius, the Prime does have a few different driving modes to change up how the car is operated. If the battery is charged, the HV-EV button can switch the car from running as a parallel hybrid to a silent EV. Hold the EV button, and the car will enter a charge mode where it will use the gas engine to charge up the battery. The HV and EV modes can be used independently of the Eco, normal, and power modes, which simply change the throttle response. Throw the Prius Prime at a corner, and you'll really start to notice what I'm on about. The Clarity and Niro, while not sports cars by any stretch, were able to keep me entertained when the roads became curvy. The Prius Prime's steering feels like it is a half-beat off from what the car is actually doing. A simple turn of the wheel results in a delayed response as the car porpoises around to catch up with your inputs. When the Prius was the only game in town, it was hard to fault it for having less-than-thrilling driving dynamics. Now, the competition has proved hybrids don't have to look strange or handle poorly. The days of having a snore-inducing hybrid are over and the Prius Prime now feels like it is stuck in the past. Like the emperor in the story, Toyota believes the Prius Prime is something magnificent because people continue to buy it over newer, less well-known hybrids. No one wants to shy away from Toyota, the company simply has too much brand cachet, which is a testament to how good the Prius has been for so many years. I choose not to be like the townspeople, telling the emperor his clothes are beautiful - I chose to be the child, telling Toyota that they should look at the other hybrids on the market and question why the Prius still looks and drives as it does. When it comes to achieving excellent fuel economy, the Toyota Prius Prime still sits near the top. However, you will have to sacrifice on space, looks, and driving fun to achieve those numbers. If I were in the market for an efficient plug-in to drive every day while my sports car sat in the garage, I'd look to other options on the market- this is why the 2018 Toyota Prius Prime receives a rating of Shop Around.